Happy Monday to all! Not like my previous weekend, yesterday was my lazy one since my husband was out of town. My SIL was out of town too, so I spent times with my brother, niece and nephew. My brother was cleaning his collection –mini figures, planes, hot wheels and bikes. 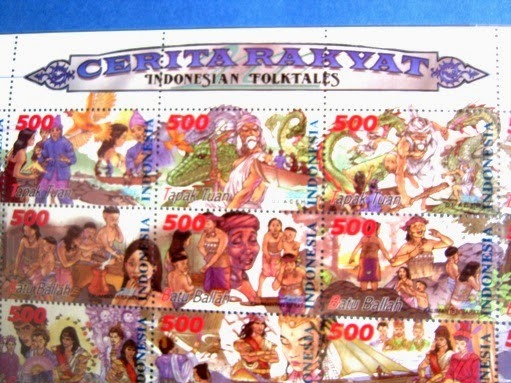 He also collects a range of Indonesia’s stamps and paper money. He prefers to collect stamps by purchasing the first envelope edition. Every edition has specific theme such as traditional transportation, Indonesian folktales, traditional games and many others. For me, each stamp is a piece of artwork. Those are interesting stamps your brother collects. I like the idea of a country's history on a stamp. As a former stamp collector, the stamps got my attention right away! Stamps would be a nice thing to collect. They do not take up a lot space and are so interesting. The stamps are interesting. It is fun to have a hobby and enjoy ! Hope you have a terrific week. Thanks for sharing. Very nice stamp...good graphical design...awesome !!! Beautiful images on those stamps! !